I attended a workshop on Writing Creative Non-Fiction on Wednesday, March 20th, conducted by Andrea Stuart, and organised by the NCF Literary Arts Desk. I jumped at the opportunity to attend, not only because it was a free workshop by a respected author, but because I am one of the Editors of an upcoming anthology of sensual memoirs by Caribbean women. I hope you know of Senseisha by now. Submissions have been trickling in, and it’s already shaping up to be one controversial read! I have always LOVED True Crime. 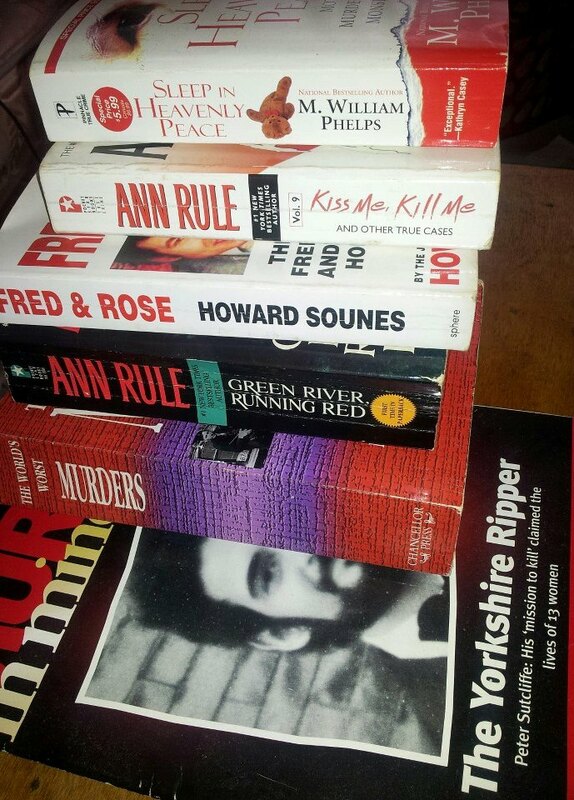 My good friends used to buy me True Crime and Serial Killer biographies as birthday and Christmas gifts. They knew they couldn’t go wrong with those – True Crime books or earrings. I always joke that if the Criminal Minds team had to inspect my bedroom (Shamar, you are welcome anytime! ), they would look at my bookshelf and diagnose me a serial killer. What does your bookshelf say about you? So…Back to Andrea Stuart – author of the books Showgirls, which was adapted into a two-part documentary for the Discovery Channel, and The Rose of Martinique: A Biography of Napoleon’s Josephine. Her third and current book Sugar in the Blood: One Family’s Story of Slavery and Empire was published in England (2012) by Portobello Books and was published in the US by Knopf in January (2013). Writing a memoir is one of the most stimulating but difficult literary challenges an author can undertake. Nevertheless, it’s a hugely popular genre. Five of the top ten hardcover nonfiction books on the NY Times bestseller list this week are memoirs. Aspiring memoir writers can find help in books and by searching online, but there’s nothing like a live workshop with a master teacher. One highly recommended instructor is Tamim Ansary, the Afghan-American author of the critically acclaimed literary memoir West of Kabul, East of New York (Farrar, Straus & Giroux). This spring, Ansary will be conducting a six-week memoir workshop in the San Francisco Bay Area, so I jumped at the opportunity to ask him about his views on writing and teaching this subject. What is a memoir and how is it different from a personal journal or novel based on your life? “Big Rock Tales” is a strip about “living in a writing whirl” created by Barbadian writer Sandra Sealy. Sandra writes, blogs, teaches creative writing and is Shakirah Bourne’s “Lit Mom” (yeah nepotism BIG TIME!). Yesterday having been UK World Book Day (US World Book Day is usually celebrated in October and this year is being highlighted on April 23rd – a Tale of Two Worlds, but that’s for another post) and today being International Day of Women it seems a perfect time to reflect a little on the stories of women, particularly in this region of the world. Although over half the world’s population and fully part of humanity, most of the voices heard and stories told throughout history have been given from a male perspective, explicitly or implicitly. It is largely within the past few generations that women’s voices have risen to the fore and are being considered as “worthy” to be told – not because of who they are being told to, but because they are worth being heard. Queen Scheherazade is more than just a soothing entertainer for her King for a thousand and one nights. Yet still there is need for more. Who can tell a woman’s story as well as the woman herself? Authenticity, vulnerability, raw truth, beneath the make-up and petticoats. And there is not just One Story for all women. There are as many as there are faces and fingers and feet. This is especially true for women in the Caribbean. When coming up with the concept of Senseisha we tried to find common Caribbean language to capture the sense of empowered, positively sexual, body & spirit-wise women. Sadly most of the terms we came across were anything but. Our folk tales, calypsos, dub, jokes and idioms are full of references to women, but mostly as a Scheherazade (bedtime entertainment for men), a Delilah (a dangerous temptress who saps men of their strength), a Jezebel (a sly lover who robs a man of his wits) or, as Red Rat once put it, a Shelly-ann (an easy sexual conquest). The strong, wise women are usually mother or grandmother figures, stripped of any semblance of sexuality. In the end we decided to make our own words and add to the lexicon; hence “senseisha”. Senseisha: Memoirs of The Caribbean Woman is about the stories that are often left untold; women raising their voices outside of the realm of male fantasy and fear to say this is who we are, this is how we feel, these are the experiences that have made us giggle, laugh, cry, curse, coo and climax. Senseisha – Call for Submissions.